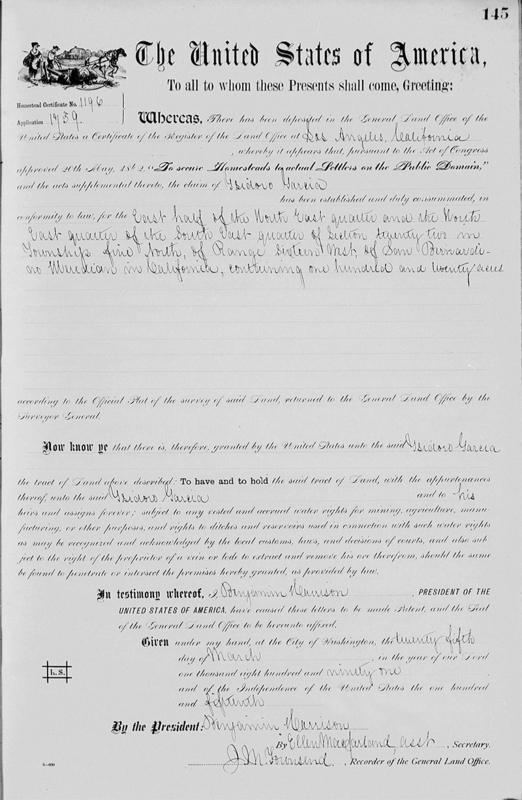 SCVHistory.com LW3190 | Tataviam Culture | Ysidoro Garcia's Land Patent, Castaic, 1891. Land patent (below) issued to Ysidoro Garcia on March 25, 1891, under the Homestead Act of May 20, 1862, for the following 120 acres: East half of the northeast quarter and northeast quarter of the southeast quarter of Section 22 of Township 5 North, Range 17 West, San Bernardino Meridian. The property is the red rectangle in the middle of the map above. The blue outline is Section 22. 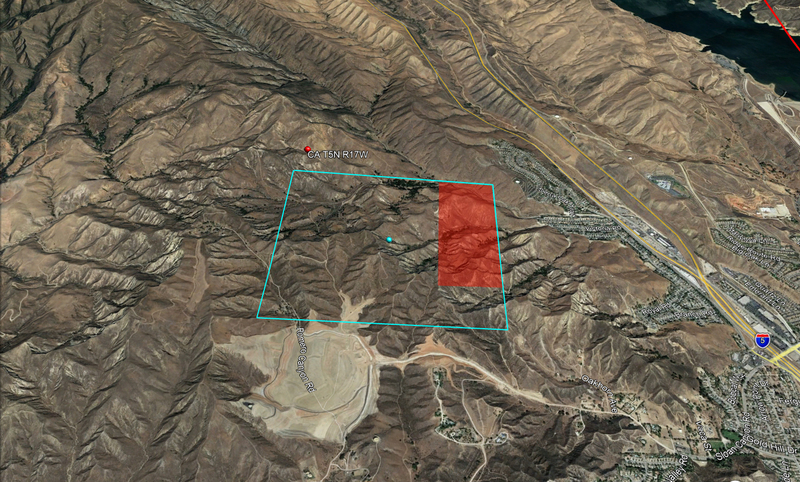 The large graded area immediately south of Section 22 is the future Castaic High School site in Romero Canyon as it appeared to Google Earth in 2017. Ysidoro was born April 4, 1860, in Stockton, to Santiago Garcia and Catalina Leyvas (which is where the "Garcia" name comes from among local Tataviam families). Ysidoro married Josephine Leyvas, daughter of Leandra Culeta, whose (Tataviam) ancestors lived in the Santa Clarita prior to European contact. As indicated, the patent was issued in 1891 when Ysidoro's land claim was "established and duly consummated." Under the Homestead Act, consummation required the claimant to build a house and grow food within five years — so Ysidoro would already have been living on the property for an unknown number of years before this patent was granted. 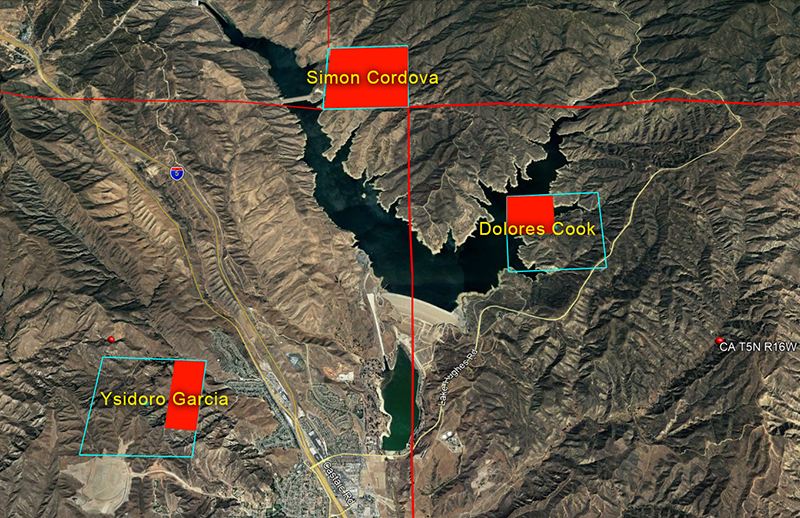 By coincidence (or not), about a week later, on April 2, 1891, a land patent was issued to Mr. Dolores Cook for the northwest quarter of Section 8 of Range 16 West, which is now under the Castaic Reservoir (see below). By that time he was dead, having been murdered in 1890 by William C. Chormicle (Dolores worked for Chormicle's adversary, Bill Jenkins). Dolores (California Indian and European) was the father of (among others) Frederick S. Cooke, who married Frances Garcia, Ysidoro and Josephine's daughter. A published report indicates the Dolores Cook family lived on this property beginning in 1882. In 1890-1891, immediately following Dolores Cook's murder, his widow, Frances Olme Cook, was swindled out of certain land in the Castaic area by Jenkins as part of an oil exploration scheme (ibid). One would presume it's the same land, and the newspaper report suggests it was where she lived, but the location it identifies — Section 19, presumably of Range 17 West, township not indicated — doesn't make much sense and leaves the question open. Nearly 30 years later, in 1919, Simon Cordova (~1866-1934), the brother of Virginia Cordova Olme, was granted a land patent to Section 8 of Township 6 North, Range 16 West in Elderberry Canyon. This was the site of a prehistoric Tataviam (and earlier) village. 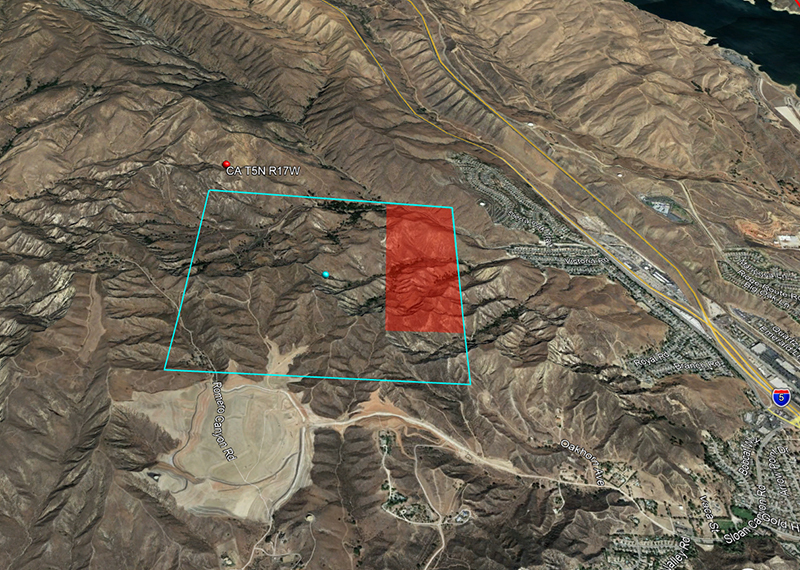 It was at least partially inundated by the Castaic Reservoir.